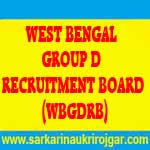 WBGDRB Recruitment 2017- Apply Online for 6000 Group D Posts:- West Bengal Group D Recruitment Board (WBGDRB) has released latest notification for filling up 6000 Group D posts in West Bengal Government offices. Desirous & eligible candidates can apply online from 03/01/2017 to 29/01/2017. Educational Qualification: The candidate must have passed Class VIII Examination from any school under the West Bengal Board of Secondary Education or its equivalent Board recognized by the State Government or the Central Government. Starting Date of Online Application : 03/01/2017. Last Date of Online Application : 29/01/2017. Application Procedure : Eligible candidates can apply online through the website http://www.wbgdrb.in OR http://www.wbgdrb.applythrunet.co.in from 03/01/2017 to 29/01/2017. Subscribe our free job alert mail for WBGDRB Recruitment 2017.